On 5 February 2018, Keith Williams, Paul Sugrue and former Welsh International Mark Aizlewood were found guilty of a £5m apprenticeship fraud scheme that targeted colleges, charities, football clubs and sports associations. Additionally Jack Harper was found guilty of 2 charges linked to attempted to defraud a single college. The convictions follow guilty pleas by Christopher Martin and Steven Gooding before the start of the trial last year. More information on convictions can be found below. On 26 February 2018, Keith Williams, Paul Sugrue and Mark Aizlewood were sentenced to a total of 25 years and 5 months’ imprisonment at Southwark Crown Court for their part in a £5m apprenticeship fraud scheme that targeted colleges, charities, football clubs and sports associations. Jack Harper was sentenced for a related fraud that targeted a single college. Additionally, Christopher Martin and Steven Gooding were sentenced following guilty pleas before the start of the trial last year. Full sentencing details can be found below. 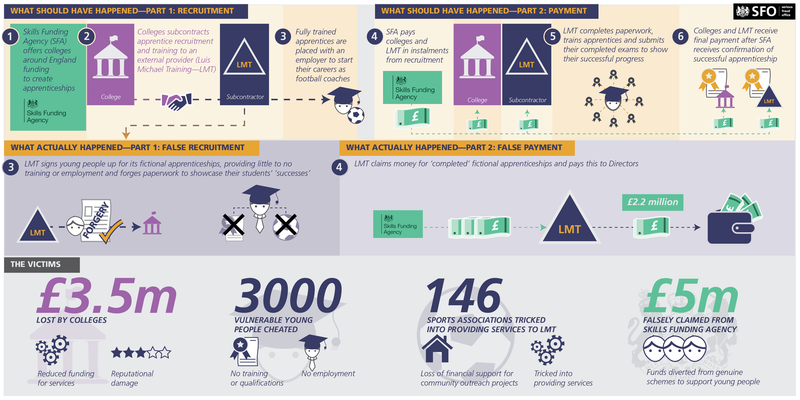 The trial focused on a 16 month period in which Luis Michael Training obtained around £5m of public money by falsely claiming to have delivered apprenticeship training to young people. On 5 February 2018, Mark Aizlewood was found guilty of conspiracy to commit fraud by false representation, contract to the section 1(1) of the Criminal Law Act 1977 but not guilty of the same charge relating to falsified financial accounts. Keith Anthony Williams was found guilty of two counts of conspiracy to commit fraud by false representation, contract to the section 1(1) of the Criminal Law Act 1977. Paul Anthony Sugrue was found guilty of two counts of conspiracy to commit fraud by false representation, contract to the section 1(1) of the Criminal Law Act 1977. Not guilty of one count of conspiracy to commit fraud by false representation, contrary to section 1(1) of the Criminal Law Act 1977. Guilty of one count of using a false instrument, contrary to section 3 of the Forgery and Counterfeiting Act 1981. On 31 March 2017, Steven Gooding pleaded guilty to one count of conspiracy to commit fraud by false representation, contrary to section 1(1) of the Criminal Law Act 1977. On 5 September 2017, Christopher Martin pleaded guilty to two counts of conspiracy to commit fraud by false representation, contrary to section 1(1) of the Criminal Law Act 1977. Mark Aizlewood was sentenced to six years. Christopher Martin was sentenced to two years and three months and five years and three months’ imprisonment to be served concurrently. Keith Williams was sentenced to three and four years’ imprisonment, to be served concurrently. Paul Sugrue was sentenced to three and seven years’ imprisonment, to be served concurrently. Steven Gooding received a 20 month prison sentence. Jack Harper received two 18 month sentences, to be served concurrently. Jack Harper and Steven Gooding were disqualified as directors for seven years each. Keith Williams £1 nominal confiscation order, payable forthwith with one day imprisonment in default , which was satisfied in full. Christopher Martin had his confiscation order readjusted, on 23 January 2019, to £15,132.15 under s.23 POCA. This was due to the realisable assets not amounting to the confiscation order initially made. His confiscation order was satisfied in full on 4 January 2019. At a further confiscation hearing at Southwark Crown Court on 18 January 2019 HHJ Tomlinson ordered Paul Sugrue to pay a confiscation order of £16,780.89. He was given until 18 March 2019 to satisfy the order or face 6 months imprisonment as default sentence. Paul Sugrue paid off his confiscation order in full on 21 February 2019, with the amount being distributed to the victims. A further hearing for Steven Gooding has been adjourned and the revised date will be published on the court calendar.